Isn't the internet interesting? So many distractions, so much information (some of which is factual), so many answers to questions we never knew we had. I mean, who knew I needed to know about Neanderthal Burial Rituals? I was sitting at my computational device a few days ago (right about the time, Sarge went all in with Bayonet Week on the Chant Channel.) and happened to be researching a topic ("Any topic, just get me something to write about!" which, of course, is the prayer offered every Sunday by mois.) when I happened upon a YouTube video from Dogfights on the History Channel. Relax, Beans, I'm building suspense. The video is at the bottom of the post. That series was one of my favorites and had some very realistic renditions/simulations of the engagements they were reporting on. Engagement being the military term for Dogfight. One "engages" the enemy aircraft rather than "attacks", "fights" or "shoots at". I don't know...Someone made Colonel coming up with that term. But, engaging as the term is, engagement is the word for an air to air furball. However, as Sarge often reminds me, at this point, I digress. So, I'm watching the video of Showtime 100 with Cunnigham and Driscoll "engaging" Col Tomb. Pretty well done video simulation along with some analytical graphics to better explain the maneuvering. The episode was filmed before Cunningham's fall from grace, so he, Driscoll and Steve Richie are providing analysis. As I'm watching it, I can feel my stomach muscles tightening as I subconsciously strain against the G's. Yes, I do that whilst flying my computer simulations also. Helps the aircraft turn better. Besides...Mrs J says it's got to help with my waistline. The video's over, and I'm back on my YouTube Homepage when Google/YouTube quickly analyzes my browsing history and pops up a new series of recommendations. 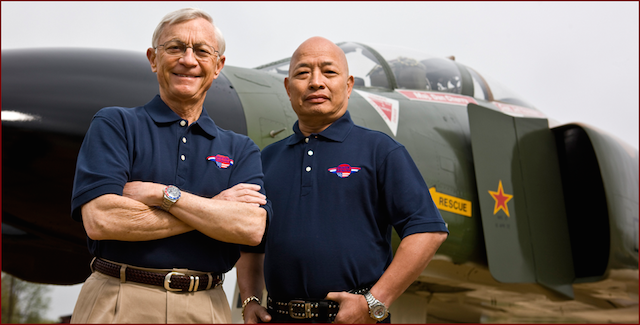 Another Vietnam era air to air engagement documented on the History Channel. Realizing that I really should be actively processing activities on the "Honey-Do" list, I click play. I'm treated to an excellent video, and as it begins to play, I recognize the name of one of the pilots in the engagement and I'm fairly positive, I've flown the jet mentioned in the clip. The Pilot was Dan Cherry and his backseater was Jeff Feinstein. At the time of the engagement Cherry was a Major. Later, I met him at Moody and called him Colonel or "Sir". He was the Vice Wing Commander. I Knew that he'd flown in Vietnam. Everybody in my Squadrons up to that point (1980) above the rank of Captain had flown in Vietnam, so it was not unexpected. 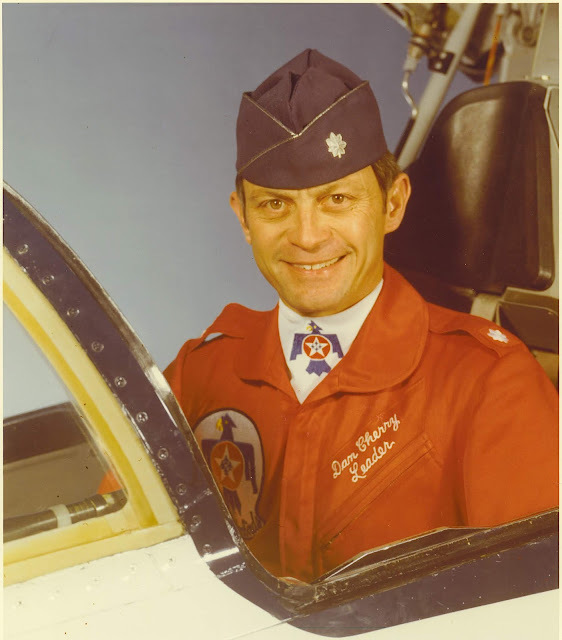 However, Col Cherry's claim to fame, as far as I knew, was that he'd commanded the Thunderbirds. Which was cool, but at that point in my career, I was more interested in employing my aircraft to do what it was supposed to do (drop bombs, shoot missiles and cannons etc) rather than in flying pretty formations. Formation flying is important when you're coming down initial and everybody on base is evaluating your flight. But other than that, it's just a method of getting several aircraft somewhere without using a lot of airspace. I do remember flying on his wing on a range ride to Eglin. (For those who don't know, Eglin AFB is near Ft Walton Beach and has a very large weapons range to the northeast of the base. I expended a LOT of ordinance there.) As Beans is no doubt aware, the Southeastern part of the country, during the afternoon in the Summer has these things that pop up with disturbing regularity. They're called Cumulo-Nimbus and flying through them is not for the faint of heart. So, I'm the element lead on Col Cherry's wing with two Lt's in the front seat of #2 and #4. I'm a seasoned F-4 guy now with 5 or 6 hundred hours in the jet. Ok, somewhat seasoned, with a lot or room for more seasoning. We're coming into the squall line and Col Cherry rocks us in to close formation. I close in and align the wingtip light with the star on the fuselage, and lign up the trailing edge of the horizontal stabilizer. That triangle puts my wingtip slightly behind and below and about 3' out of #1's wingtip. My WSO confirms that my wingman (#4 ) is in formation, but bobbling a bit. Which is normal, if a little bit concerning. It's going to get rough enough, no need to bounce in clear air. But that's Lead's issue. I've just got to keep the light in the star. Which is unbelievably easy. Apparently, his aircraft is not moving although a quick look at my instruments still show us at about 400K and the Distance to Moody is still decreasing. As we enter the thunderstorm, Col Cherry starts talking, "ok, coming right. ready, ready, now." "Rolling out, ready, ready, now"
This goes on for forever, (If you've flown formation in the weather, you know what I mean.) 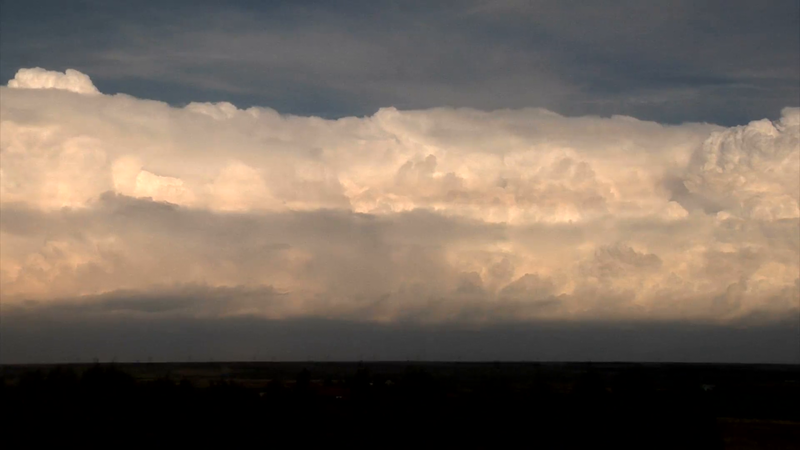 Finally, we break out on the far side of the storm. #2 is still in formation. I ask the WSO about, #4. "He didn't move an inch." I guess Thunderbird Lead was good practice. However, at no point in my association with him (Mrs J at the time was the Wing Commander's Executive Officer, so we interacted regularly) did I know he'd shot down a Mig-21 in Vietnam. So, I watched this video with a lot of interest. I think there are a few take away's of interest. 1. This was April of '72 for all intents and purposes, the War is going to be over for the US in 9 months. We've been fighting Air to Air over North Viet Nam for several years, and of the 10 missiles on Basco 3 and 4 (2 x Aim 7's and 3 X Aim-9's each) , 6 were launched at the Mig and only 1 worked. That's just wrong! 2. Again, we've been in the War for quite some time. We're still using Fighting Wing as the tactic. This tactic involves the wingman being very close (relatively speaking, he's about 1500'-3000' away from his lead) and is supposed to be protecting his 6. In reality, he's trying to avoid hitting his lead and isn't watching squat else. It speaks well for the wingman that he's in that formation and spots the pop-up Mig-21 in front and above Col Cherry (that only could have happened because #4 was low and outside the formation looking up at Col Cherry. Spread formation had been developed and tested (Robin Olds) well before this fight. WWII generals far from Vietnam dictating tactics? 3. I liked the thought process that went through Col Cherry and his wingman's minds when it became obvious that #3 had a weapons problem. Without much coordination, #4 took the lead and continued to press the attack until having weapons and radio problems of his own. Col Cherry was then able to regain the lead and fire the kill shot without endangering his wingman. Enough about debriefing the engagement. They did thing's right, made the best of some interesting obstacles and got the kill. So, after watching the video, I wondered what had happened to Col Cherry after I left Moody. Well, he went on the become the Wing Commander of the 8TFW at Kunsan AB ROK, former home to your's truly and Sarge. Was promoted to Brigadier General, retiring in 1989 as Commander of AF Recruiting Service. He also arranged for the preservation of the F-4D he'd scored the victory in, Tail # 66-7550. The Aircraft is restored and is at Aviation Heritage Park in Bowling Green Kentucky. As I said earlier, I'm pretty sure I've flown that aircraft. I remember one of the 80th TFS jets had a single star on it and the tail number seems familiar. Got to find where I stashed my flight records and see. The thing that impressed me most about Neanderthal burial customs, was that they decorated the graves with flowers. How civilized! They were capable of love, and knew beauty, and saw to it that the ones they loved, left the world in beauty. Yay, Neanderthals! I noticed that also, Scott. Maybe we haven’t evolved all that much. Or more likely, based on the news, we’ve devolved back to Neanderthal srage and havent reached bottom yet. From what I've read by the big brains on the subject, Neanderthals' brains were more designed for emotion and sensory, while Homo Sapiens evolved the analytical portions all out of proportion. Even now, some research shows that Neanderthal genes tend to give a more emotional scope. Combine N genes with HS genes and you get compassionate analytical people and, boy, that's a weird combination. As it is, Neanderthal invented a whole lot of stuff way before Homo Sapiens ever got around to thinking about things. So, no knocking the Neanderthals too much. You mean the L and E genes? I'm too lazy to work, but envy the things that people who do work have? Well Andrew, the scientific name for Neanderthals is Homo Sapiens Neanderthalensis. We more modern people are Homo Sapiens Sapiens. Or at least that was what I was taught some 45+ years ago when I studied Anthropology. It may be that we ( HSS ) interbred with them and thus absorbed them or that we just killed them off, or some combination of the two. As far as I know, that has yet to be established. Yup. I was just using shorthand, so to speak. There's a lot of back and forth as to HSS and HSN genes comingling and who killed whom. Until we can access alien records or create a time machine, we'll just have to speculate. Again, given events lately, I’d say it’s a combination of both, Paul. Probably more of the latter. What a tale! I vaguely remember one of the birds at Kunsan having a single red star painted on the variramp. Now I know the backstory, awesome! 66-7550 (MSN 2085) shot down MiG-21 Apr 16, 1972, flown by Maj. Dan Cherry and Capt. Jeff Feinstein of 13th TFS, has one red star on fuselage. Named "City of Fairborn II" with 89th TFS in May 1989. Was preserved at Tinker AFB, Oklahoma. Was on display in front of VFW in Enon, Ohio. Seen 2007 at Aviation Heritage Park, Bowling Green, Warren County RAP, KY. Went under restoration at Bowling Green for display at the Aviation Heritage Park. Since Sep 23, 2007, located at Aviation Heritage Park, Bowling Green, Kentucky. Found it here! 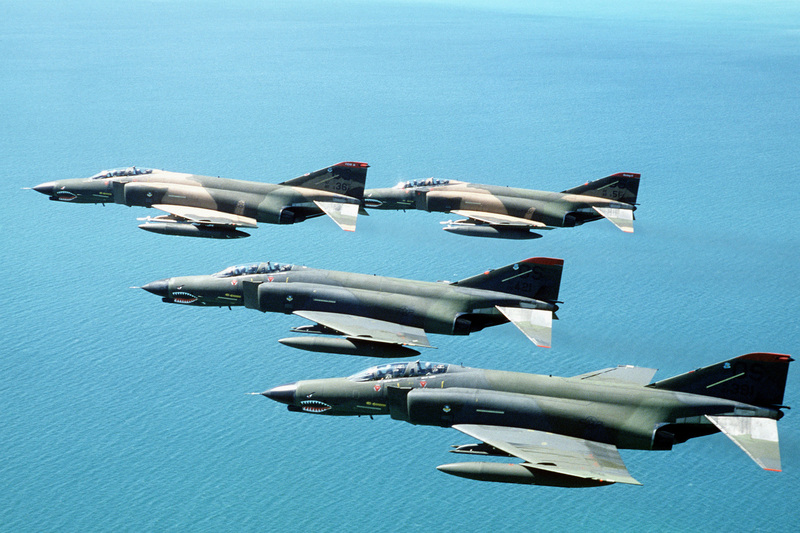 F-4D 66-7550 was assigned to the 8TFW (80 TFS AKA "The Juvats") from 1974 to 1982 when it was transferred to the Reserves and replaced by an F-16A. Searching on the full tail number (with the 7) seems to have made a difference. Who knew? So I have my fingerprints on that bird as well. Nice to know she survived to be a display bird. I also recall that it was a reliable bird to fly. Back when "Second Worst" was in office, parts limitations made that problematic. That jet always seemed to work. Maybe the Star meant something. "It is appearances, characteristics and performance that make a man love an airplane, and they, are what put emotion into one. You love a lot of things if you live around them, but there isn't any woman and there isn't any horse, nor any before nor any after, that is as lovely as a great airplane, and men who love them are faithful to them even though they leave them for others. A man has only one virginity to lose in fighters, and if it is a lovely plane he loses it to, there his heart will ever be." Oh, I know. Seen guys carry on the same way over cars, bikes, lawnmowers, saws and other tools, armor, beer, diet Coke (no, really!) and such. It's what guys do. They elevate their tools and belongings, ascribe human traits to them. It's all part of the bonding process that started when Man in his various forms first did neat stuff with things and creatures. Yeah...us guys! Which includes you. Always enjoyed the Dogfight vids, that North Vietnamese pilot was one lucky guy. Missile failure mentioned was reminiscent of the WWII torpedo debacle we had. Very interesting comments and perspective from a pilot's view juvat, a good way to chase the sleep from one's eyes. Thus you get a snowy salute from the Northland this morning. Very Lucky. BG Cherry had to aggressively move his aircraft to avoid hitting him in the chute. You're right about the similarity although the torpedo debacle happened at the beginning of the war. We had missile issues in the Mid-60's but they were generally fixed in the late 60s, but somehow reoccurred during this time frame. Course it could have been just two sick jets that day. Who knows? By the end of the Vietnam War we were expending ammo that had been stored for way too long. Lots of issues with iron bombs, old fuses and such. Wonder if the crop of missiles was old storage. Or if some peacenik working at the factory decided to fiddle-fart with them. Bad if it was the first. Hanging offense if the second. Well, hanging offense to the procurement people if it was the first, too. One of the first live ordnance sorties I flew, the ordinance was MK-117s. Korean Era weapons. Transitioning to the F-4, our training missiles were AIM-7E and AIM-9C. Exactly the missiles BG Cherry used. The IP's and IWSOs I flew with had nothing good to say about those weapons. When I got to the Kun, the Aim-9s they had there were AIM-9Ps which were pretty reliable. (I shot one in the PI from the Eagle. It guided and passed within lethal radius of the drone. Didn't have a warhead and didn't actually hit, so I didn't get to see splodey stuff.) At that exercise, we fired several AIM-9Ls & Ms as well as AIM-7F and Ms. All launched, guided and fused properly. Couple of the guys got to see the splodey stuff. So...I don't know, maybe with Reagan, we got serious about building good stuff. Oh, and we put a gun on all the fighters. At the end of the F-14 era, there were some serious speculations as to whether it's primary missile, the Phoenix, would function correctly, seeing as most of them were as old or older than the airframes they were carried on. But now we have the AIM-120D that matches the range parameters of the Phoenix, and is, by all accounts, much more capable. We hope. Great post! Always good to see more flying around in marvelous machines. I can remember flying in the weather for three or four days on a sixty minute flight in the good old Deuce. On the wing of my Flight Commander and drinking instructor, Jesse Locke (RIP, Jesse). One of my most vivid memories to this day is breaking out, in the rain, at night, on his wing, touching down seemingly instantly. Lots of learning done on that one for that 1/LT soon to be known as "Fuzz". BTDT and more than once. Even did it once under some dire circumstances. Can't even imagine trying to shoot something down as maneuverable as a Mig-21 and have continuous weapons malfunctions. Would not want to be around when he got back to Base and had a talking with the armorers. Yikes. Would be bad if he just blistered them with verbal hot-sauce, but even worse if he just did that stern, quiet disappointed Dad voice. "Dogfights," back when there was actual history on the History Channel. Apropos to history but not the History Channel, just watched a show on TLC about Vikings in America, and the narrators and crew were wondering how the Viking peoples could handle living in Nova Scotia in the winter-time. Completely ignoring the fact that it was 5-8 degrees warmer back in the 900-1200s, they found that medieval people could actually dress for winter. Duh. What goes for history these days. Yeah, the easiest way to leave a fight is for the other side to have no one left. Difficult to do if you are effectively disarmed. I would say that the Chief of Maintenance had some 'splainin to do at that evening's standup. The Phantom makers in STL gave us a nice (but small) model of the aircraft when we picked them up at Lambert Field (a lapel pin too). The Sparrow people gave us a model of the "weapon" when we first fired one of the things. They never really worked like the manual said. In the Deuce world, the mighty 2.5 FFAR pretty much went somewhere in front of the aircraft. The Hughes missiles contained in the belly of the aircraft typically were of the "sand seeking" type. The missile bay in the Deuce was best suited for suitcases and bringing booze, wooden bowls, salad forks and black velvet paintings back from Angeles in the Philippines. The avionics bay behind the seat in the single seat Eagle perforned much the same role, Dave. I wonder how long it will be before the PC police decide that couples should no longer be “engaged” before they are wed? Another engaging question, Skip. My guess that policy decision is already loaded and is headed down the slipway. A most informative and entertaining post, as usual. Thanks, Paul. Sorry about the extended response time. Somebody tested the backhoe vs fiber optic cable in our area. No surprise...backhoe won. Well...Thor was tossing some pretty impressive lightning bolts. One of the things that has always impressed me in watching the interviews with former fighter pilots is that they invariably still have piercing eyes. My wife refers to them as "hunter's eyes". The recorded interviews of WWII pilots that were made in the 70's and 80's showed them even in relatively old men, and the interviews from the Dogfights series did also. Once a raptor, always a raptor! Hmmm. Maybe it’s all that squinting. But, as I’ve said, Fighter Pilot is an attitude, not an AFSC.